This evening promises to be filled with Tango Magic. 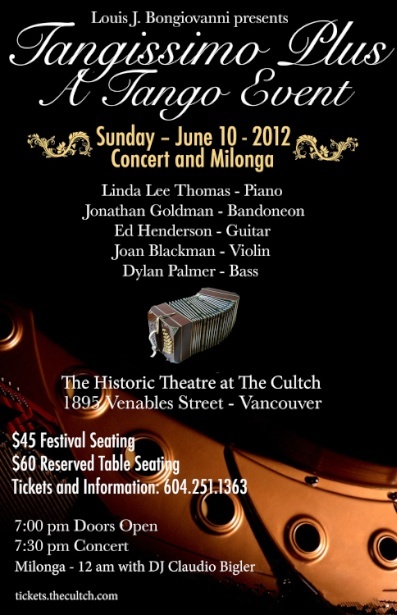 The musicians will be two members of Tangissimo – Linda Lee Thomas, piano, and Ed Henderson, guitar. 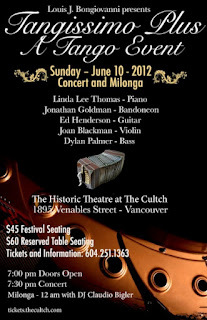 They will be joined by Jonathan Goldman, bandoneon – Joan Blackman, violin, and Dylan Palmer, double bass. The music they perform will be original quintet arrangements by Astor Piazzolla as well as more traditional tangos from Argentina. Following the concert, the Historic Theatre will become a dance hall where the audience will have the opportunity to dance tango until midnight. Acclaimed Claudio Bigler will be the DJ. This evening also marks the beginning of Linda Lee’s latest recording project – TANGO CON FAZIOLI! The incredible handcrafted Italian piano is her favorite – and she loves the wonderful music of Argentina – so why not put them together? In August she will continue this project in Buenos Aires on a Fazioli Concert grand with her musician friends from the birthplace of Tango. $60 Reserved Table Seating Sold Out!